One of my favorite food writers and cooks, Mark Bittman, just wrote a piece for The New York Times about eating out in Amsterdam. He starts out by saying that when he set out to find real Dutch food about 10 years ago, it was a failure. 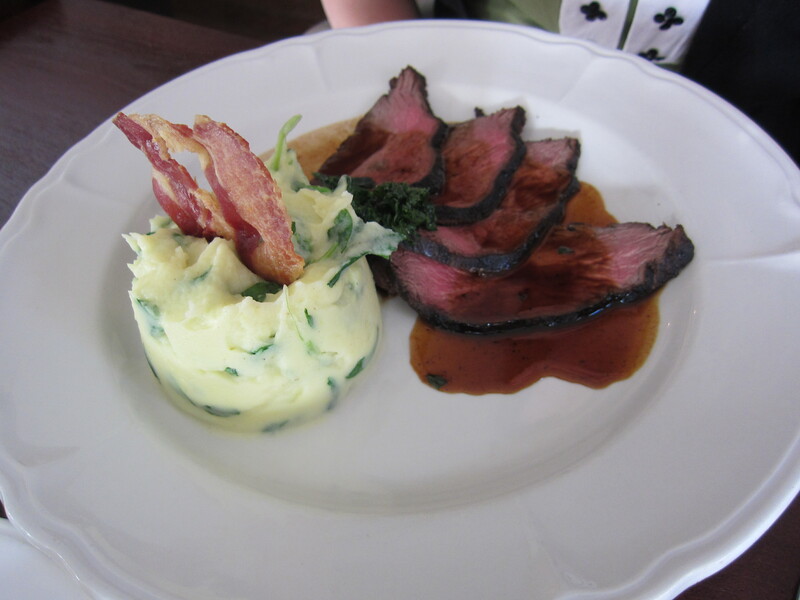 A recent visit however, shows that Dutch cuisine is rising and the chefs there are actually cooking real Dutch food and using Dutch ingredients. Now while I didn’t go to the Netherlands 10 years ago so I can’t compare the current dining scene to what it used to be, my experience was very similar to his. The first few visits, whenever I told the Dutch (including my hubby) that I wanted to eat Dutch food, they would look at me quizzically and then mutter something about how there really isn’t anything much to Dutch food. They would persuade me to eat Chinese, Italian, and Indonesian. While I realize that Indonesian food, especially the rijsttafel, is part of the Dutch cuisine, it doesn’t really count for me. What did the Dutch eat before they colonized another country? Whenever I asked them about classic Dutch dishes or restaurants that I needed to try, they would inevitably mention a pancake house and the usual herring, stampot and meatballs, poffertjes, croquette / bitterballen, and pea soup items, which is all very good but surely there’s more? I started to wonder whether I would ever meet a Dutch person who was actually excited and knowledgeable about Dutch food. My hubby, like many of the other Dutch people I know, has quite simple tastes. He’s happy with the same sandwich, and by sandwich I mean one with only three ingredients max, every day. 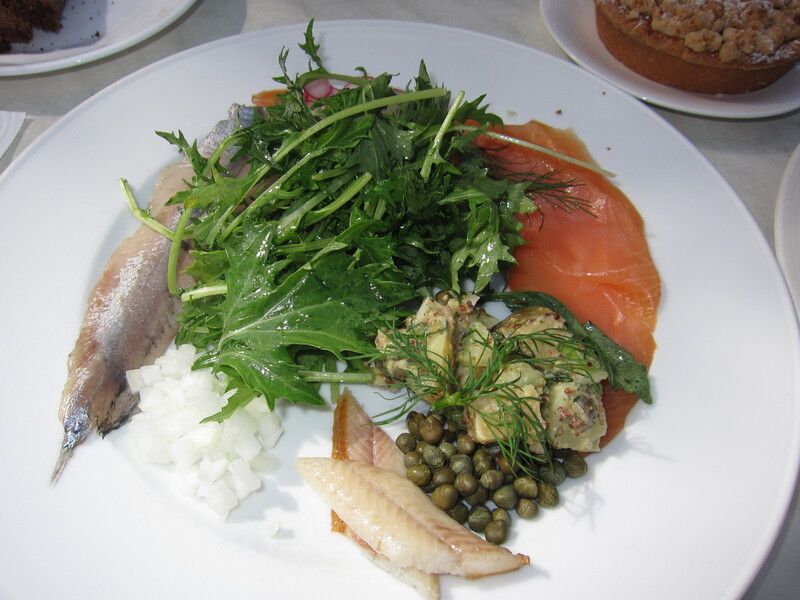 As Mr. Bittman reports, there’s been vast improvements in the Dutch dining scene. 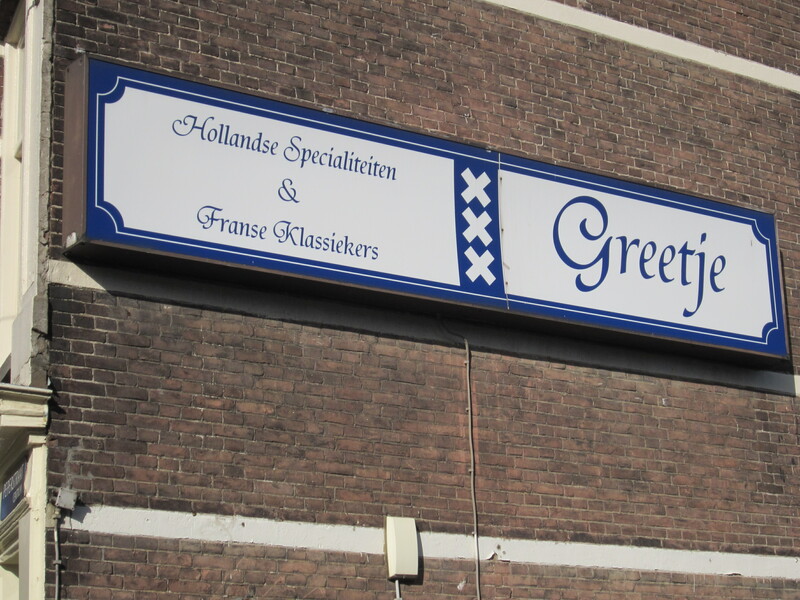 One of the restaurants that he features is Greetje. Greetje, named after the owner’s mother, has actually been around for quite some time. In Mr. Bittman’s words, “Greetje serves the most honest and thoroughly Dutch food of the restaurants discussed here.” While his visit failed to knock his socks off (an off-night perhaps? ), we loved our time there. Greetje aims to reintroduce Dutch specialties to the country’s inhabitants. It’s not 100% Dutch as French technique is used but it gets pretty close. Greetje is a short walk from the Amsterdam Centraal station, in an area that’s a little off the tourist track. 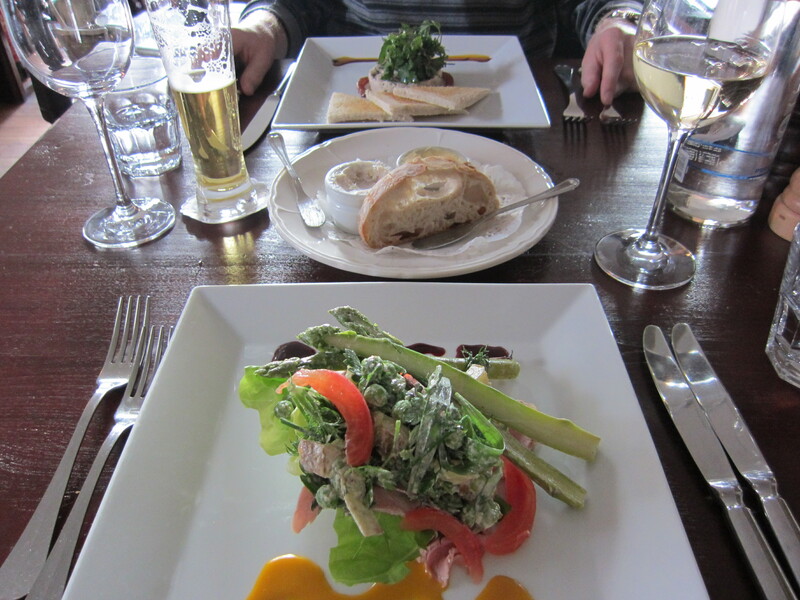 We started off with bread that came with two accompaniments: one was butter and another pork fat with apple and onion. The pork fat with apple and onion was heavenly (if you’re an adventurous eater of course). 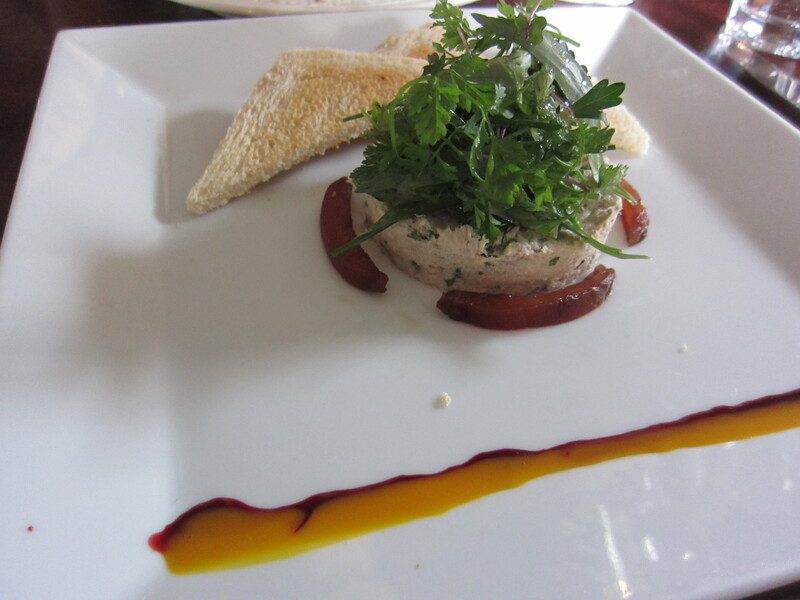 For starters, Hubby got the wild duck pate served with onions and bread. I got an asparagus salad with ham, potatoes, peas and tomatoes (it was asparagus season when we went). 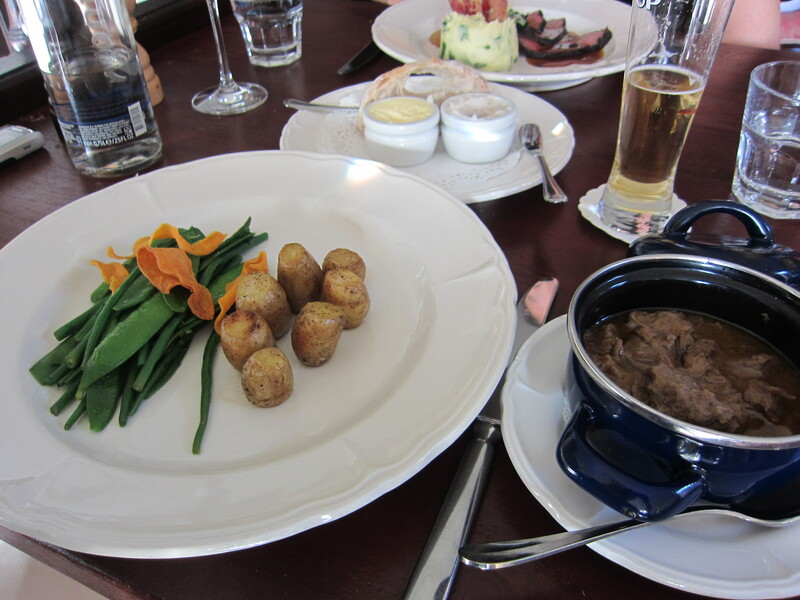 Main courses were beef (or was it boar?) stew with potatoes, carrots and peas, and beef in red wine sauce with mashed potatoes (with kale mixed in) and bacon. 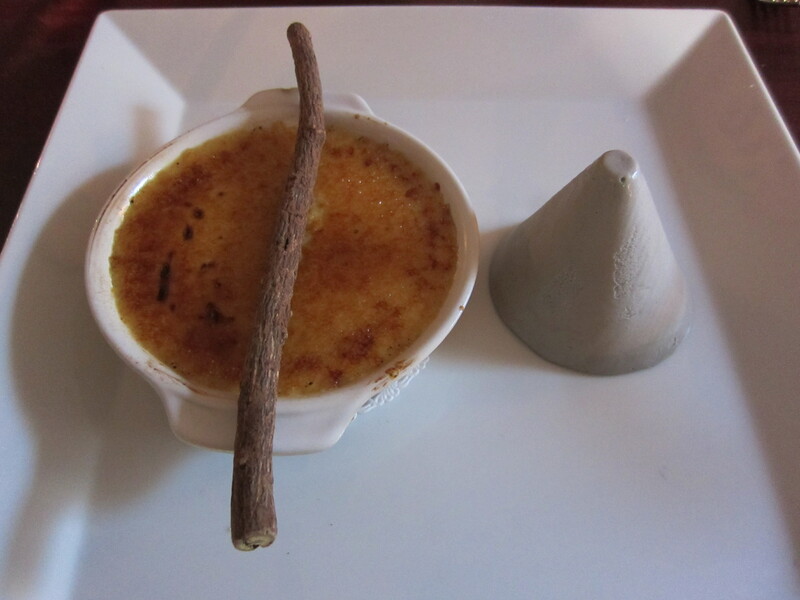 For dessert, we had the creme brulee made with licorice wood extract (you can chew on the stick, which is the licorice root) and Dutch black licorice ice cream. The service here was impeccable and the atmosphere very lovely and, as the Dutch would say, cozy. Of course, you can’t leave Amsterdam without trying out an Indonesian restaurant. 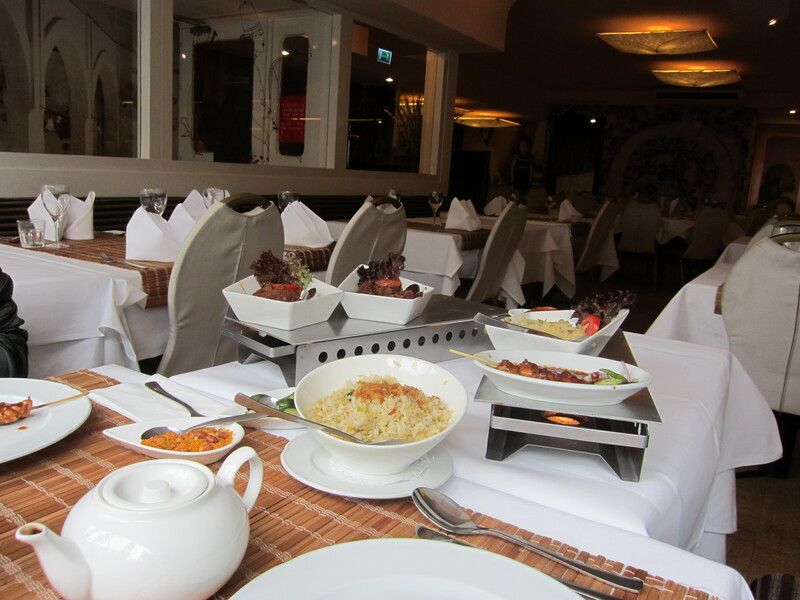 Before getting my fill ethnic Dutch food at Greetje for dinner, we actually went to Long Pura for a small rijstaffel. The restaurant was virtually empty as we went later in the day. The food was good although I’m sure there are better Indonesian places with lower prices. I only spent one day in Amsterdam this visit around so I’m eagerly looking forward to my next visit for more good Dutch food! On a side note, I again ate really good Dutch food a few months later but this time back home in the States. The Legion of Honor in San Francisco had a Dutch and Flemish Masterworks exhibit and to go with it the cafe offered Dutch fare to go with it. The Legion of Honor Cafe produces pretty good food usually and this was no exception. The line was long and all around us were Dutch and Dutch-American people. 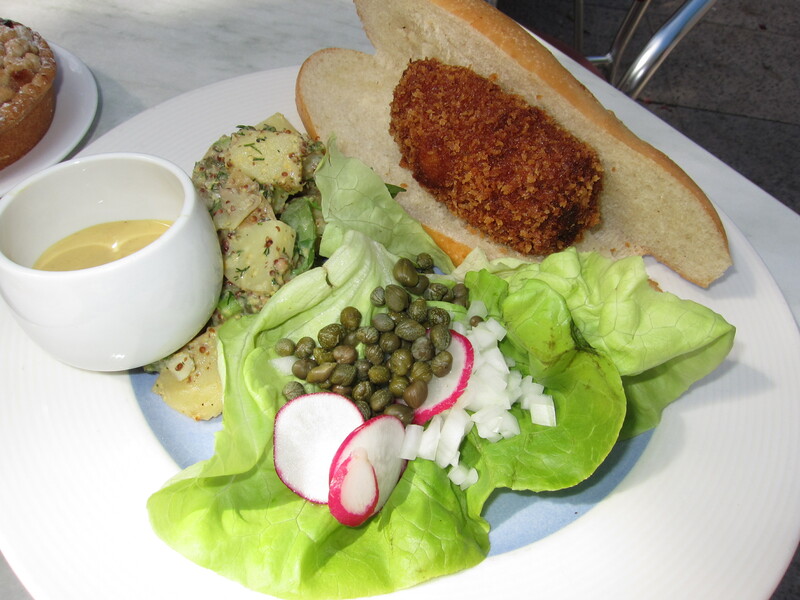 We got a smoked fish platter, a croquette sandwich with salad (both the fish and croquette dishes came with potato salad that was dressed in a mustard dill sauce, and Dutch apple pie. 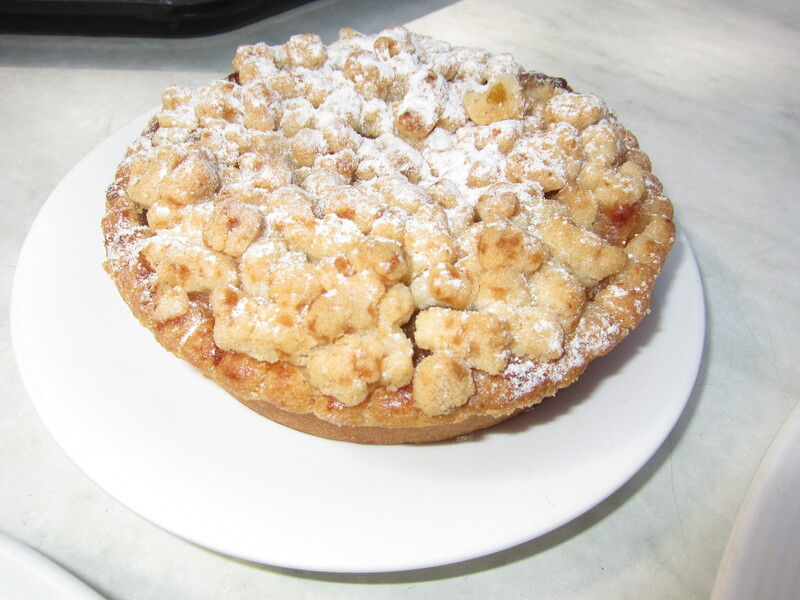 I love Dutch apple, which is less sweet and is topped with streusel. I didn’t chew on the licorice root. I suppose it would be like chewing on bamboo a bit. The Dutch licorice ice cream was interesting, you’d like it if you like ice cream flavors like green tea.